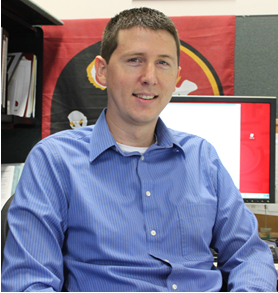 With the Florida State University banner at your cubicle, I have to believe your background is meteorology. How did all of that begin? Hurricane Andrew had a big impact when I was young. I was in fourth grade and lived in Venice on the west coast of Florida. We were concerned it was headed our way. It ended up going out into the Gulf. But the storm piqued my interest. My uncle lived in Cutler Ridge at the time and lost his house. He was a firefighter for Miami-Dade and I could see the impact the storm had on people. This probably was a major factor that motivated me to learn more about the atmosphere. So, it was off to Tallahassee and FSU. I received my undergraduate degree in meteorology there and also a Master's under Dr. Fuelberg. I always knew I wanted to be more on the technical side with computers as well. So, I pursued a minor in computer science in addition to the required minor in math and physics. Toward the end of my undergraduate years, I became very interested in Geographic Information Systems (GIS). I quickly realized that GIS would be ideal for analysis of meteorological data, especially when making relationships to other fields. I was lucky enough to be able to finish up the geography courses required for a GIS minor while in graduate school. What happened when you entered the real world? I was working with Dr. Fuelberg on a rainfall project under the Florida Department of Environmental Protection. I love Tallahassee so I thought at first I might head in that direction. Then a friend from graduate school sent me a job posting for a contractor position for the National Weather Service with the Meteorological Development Lab (MDL) in Silver Spring, Maryland. It always intrigued me to go up to DC and my goal was to work for the National Weather Service, so I saw this as a pathway. I worked on software for a four-dimensional GFE (Graphical Forecast Editor) that displays flight-level turbulence and icing. It is a prototype being used in the Alaska Aviation Weather Unit (AAWU) in Anchorage. How'd you come to NHC? I wanted to move from contractor to the federal side, and the Hurricane Center was always a career goal since before college. I saw the opening, applied for it, did the interview, and was offered the position. I was always skeptical of moving to Miami, but it was a tradeoff to work at NHC. I am told you don't like being called a "webmaster". Why? I don't mind, but my job is so much more than just maintaining the web presence. I really don't get to spend as much time on the web as it deserves. I have a lot of ideas that I am not able to implement with everything else going on. There are so many other things we are doing here, especially being down a few positions. We touch many facets of the forecast process in TSB, which I enjoy. Our primary priorities are to ensure the forecasts are available to the customers and that the forecasters on duty receive the latest and greatest data to make the best possible forecast. In our down time we maintain these systems and improve the tools and efficiency of the process. Technology is constantly changing and so it can be difficult to manage all of the ideas and possibilities to improve each part of the process. What is your greatest challenge here? It's probably bridging the gaps between technology, science, and operational forecasting. The big project at the moment is implementing AWIPS II and making sure everyone is on the same page, from the developers to the users. We are kind of in the middle of these groups and so managing the expectations and realities of the migration is a careful balance at both ends of the spectrum. We are challenged to integrate the new system into our operations and ensure the forecasters understand it, they're happy with it, and that progress is being made toward our local goals at NHC. You're a young guy. Where do you go from here? Well, since NHC has always been a major goal it will be difficult to top. I enjoy my responsibilities here and being able to see the direct impacts of my work on the mission. But I also have a young family, and I would like to own a home and attain a little better quality of life. If there were the right opportunity out there, I wouldn't mind a new challenge. Having the young family takes care of your outside life. I like to spend a lot of time with the family and I enjoy being a parent. When possible, I like to participate in local community activities and I am always looking to get more involved. I enjoy exploring and anything that has to do with being out on the water. I live inland, so that's a little difficult to do where I am at in South Florida. But I grew up on the water along the Myakka River, and spent a lot of time boating on the Intracoastal Waterway, too.